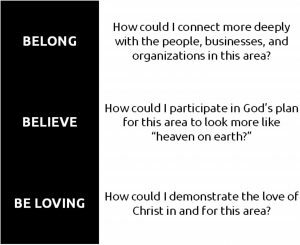 Our church leaders have sensed a clearer call from God – to be Christ-like neighbors around our church and in our own personal neighborhoods. I am excited to see what the Holy Spirit does as we open our eyes, our minds, our hearts, and our souls in new ways to our neighborhoods! The first step (pun intended) in this process is to walk our neighborhoods prayerfully. I invite, encourage, and challenge every single person in our church to pick a block around the church or near where you live and try to see it with the eyes of Christ. I will have some specific prayer guides for the blocks around our church, as well as more general prayer guides you can use with any block. How could I connect more deeply with the people, businesses, and organizations in this area? How could I demonstrate the love of Christ in and for this area? When? Sunday October 14, Sunday October 21, or any day of your choosing! There is no need to sign up for a particular block, but if you or your group are intending to participate I would love to know so I can celebrate with you. Pictures are also always welcome!